Starocherkasskaya, formerly Cherkassk (Черка́сск), is a rural locality in Aksaysky District of Rostov Oblast, Russia, with origins dating from the late 16th century. It is located on the right bank of the Don River approximately 35 kilometers (22 mi) upstream from the major Russian port city of Rostov-on-Don. Efremov, were a noble family of Don Cossacks origin. Earliest reference date back to 1670, with Efrem son Petrov being the oldest of known ancestors. He went to Cherkassk around 1670 as a merchant, and was an Ataman of Don Cossacks in 1702-1705. He was murdered by Kondraty Bulavin during the Bulavin Rebellion. Efremov were among the most prominent and rich families of Don Voisko. Monument to Stepan Razin is one of the monuments in the city of Rostov-on-Don, Rostov Oblast, Russia. 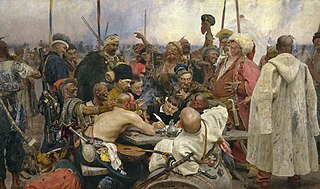 It is dedicated to Stepan Razin, the leader of the peasant uprising of 1670-1671. The monument is also considered to be an object of cultural heritage. Kondraty Bulavin house - a historical building located not far from the main square of Starocherkasskaya, practically opposite the Peter and Paul Church.